Registration for August is still open, so go ahead and give it a shot! Remember it’s open to both bloggers and readers alike. This month, I was matched up with Jamie over at Inspire Fitness and Wellness. Head on over and check out her blog when you’re done here. In her note, she mentioned that she’s also a runner like myself. Yay! 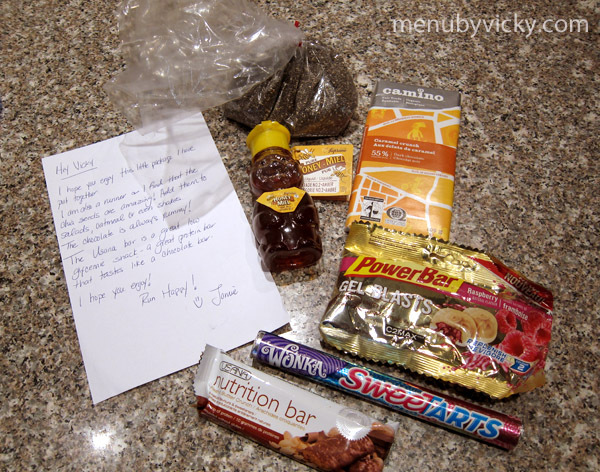 So I got an awesome package of running related goodies which included: a bag of chia seeds, honey, a protein bar, a chocolate caramel crunch chocolate bar, energy gel chews and Sweet Tarts. I plan on trying out the energy gel chews during my long run this weekend and will enjoy a piece of the chocolate caramel bar and some Sweet Tarts after my run. 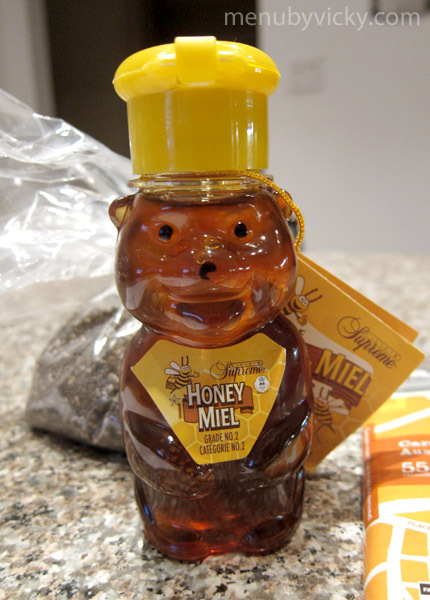 And the protein bar and the honey will go with me to work. I love having the protein bars around because there are days when I don’t get to go downstairs right at noon for lunch. The honey bottle is the perfect size for my desk and so so cute! Finally, I love the chia seeds because they’re a great source of protein and energy, electrolytes and antioxidants. Perfect for anyone who participates in endurance sports (not just running). If you’re wondering how you can incorporate chia seeds into your diet, check out my recipes for banana chocolate chip protein pancakes and peanut butter oatmeal chocolate chip protein cookie balls. But you can also add them into your post-workout shakes, oatmeal, baked goods and just about anything else you want. They’re almost flavorless so you won’t even notice that they’re there. That’s it for July! I think it’s a great way to end the month! And as for my package? It was sent to Pascaline of In Stevens Heaven. To find out what I sent her and whether she liked it, head on over to her blog. 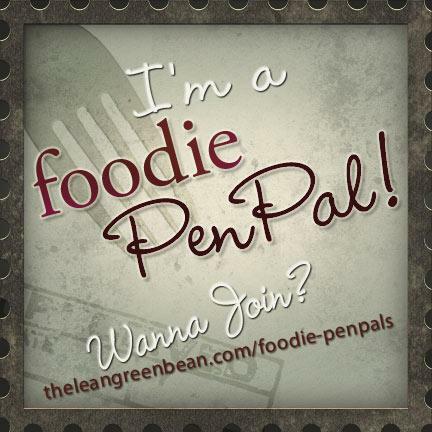 And if you want to participate in the Foodie Penpals program for August, head on over to the Lean Green Bean to sign up! Chia seeds can also make a good pseudo-tapioca since they absorb moisture and get gelatinous when put in a liquid. There’s a lot of easy recipes out there if you haven’t tried it!